Ah, what a trip down memory lane looking at this phone induces. 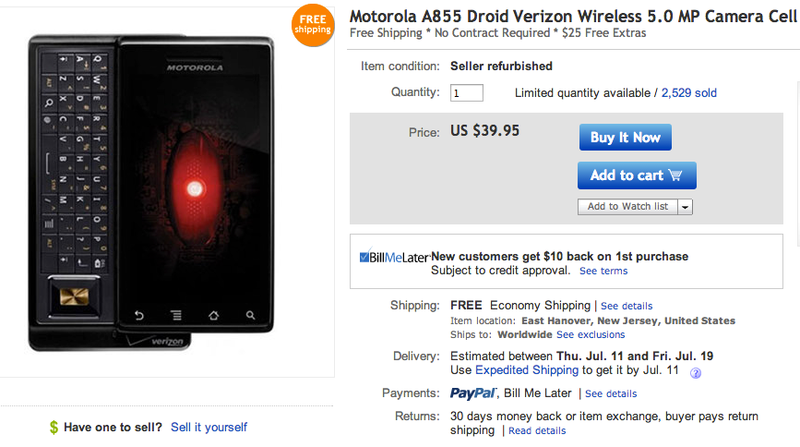 For me, the OG DROID from Motorola is what started it all and I am positive that I am not the only one. Many of us got our start in loving the green robot with the DROID, so here is a chance to pick up the most beloved Android device for just $40. The specs don’t quite match up to any of 2013’s flagships, as the 3.7″ “high resolution” display, 5MP camera, Android 2.0+ (later upgraded to 2.2+) and 256MB of RAM seem a bit outdated. What a ways we have come since then! They are being sold seller refurbished, but for $40, you can’t beat that deal.